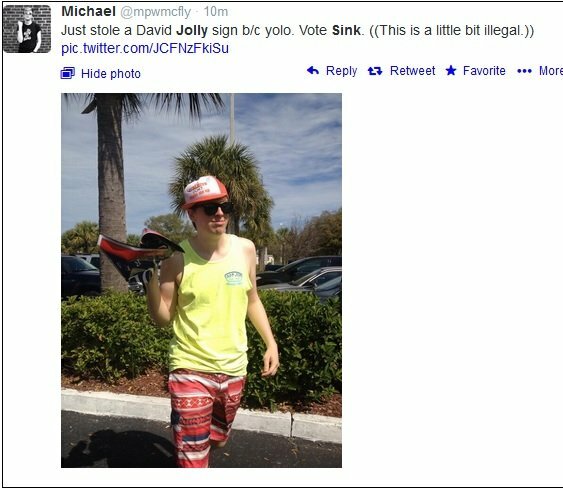 Democrat Alex Sink volunteer Michael @mpwmcfly stole Republican David Jolly‘s campaign sign from a yard in Florida. Michael was so proud of himself that he tweeted it out on the internet. It looks like Michael made a big stupid mistake. In Florida stealing a political sign is considered petty theft, a misdemeanor. It can land you in jail and a $1,000 fine. UPDATE: Michael has deleted his Twitter account.